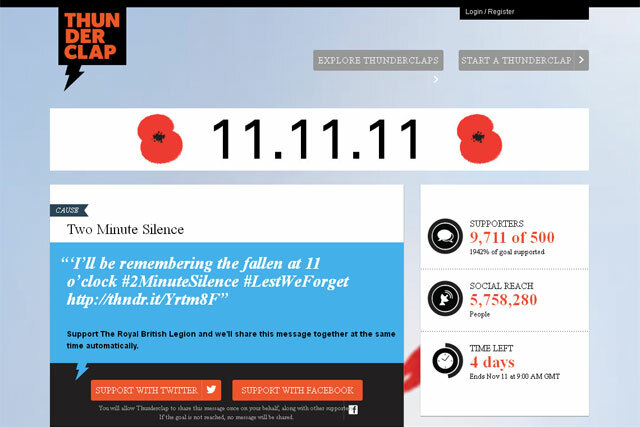 The Royal British Legion has signed up to use the new Thunderclap social media tool, which will simultaneously publish pre-written tweets and Facebook updates from its supporters at 9am on Remembrance Sunday. The charity, which supports former and current members of the armed forces, claims to be the first UK organisation to use Thunderclap. The social media tool allows groups to automatically issue identical social media messages at a designated time. Visitors to the Remembrance Sunday page on Thunderclap, who opt in to the campaign, will have the message "I'll be remembering the fallen at 11 o'clock #2MinuteSilence #LestWeForget" updated on their Twitter and Facebook accounts at 9am on 11 November, ahead of the two-minute silence at 11am. Helen Hill, head of remembrance at The Royal British Legion, said: "We hope to create the largest ever show of online Remembrance by using the communicative power of social media to remind millions of Britons that they have a very personal opportunity to honour the men and women who paid the ultimate sacrifice." Deliberate PR introduced Thunderclap developer De De, a spin-off from Droga5, to the Legion and worked with the Legion's press office team on the campaign.